A woman on her way from Leipzig to Halle in Germany got the surprise of her life when her daughter decided to arrive inside the moving train! On Thursday morning, a woman was on her way to the hospital at Elizabeth Hall when her contractions began. The mom thought she still had time, but as the train moved, it seemed her daughter had other ideas. As her labour progressed, a witness recalls that announcements were made inside the train if there were any doctors and nurses onboard. 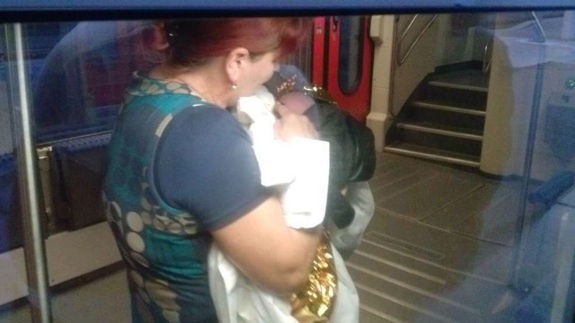 The woman was soon led to the disabled toilet of the train and because they couldn’t find a doctor, she gave birth to a healthy baby girl at 5.30 am with help of two fellow women passengers who acted as midwives. Doing his part, the conductor called an ambulance that was ready to pick the newborn and mom as soon as they arrived at the station, along with waiting paramedics. Frank Klingenhöfer, head of the Deutsche Bahn subsidiary DB Regio southeast, said their entire team was moved by this miracle. Because of the exceptional circumstances, the company has decided to give a free ticket for life in the local trains in Saxony, Saxony-Anhalt and Thuringia to the extremely special child. Mom and baby are said to be doing fine at the hospital.